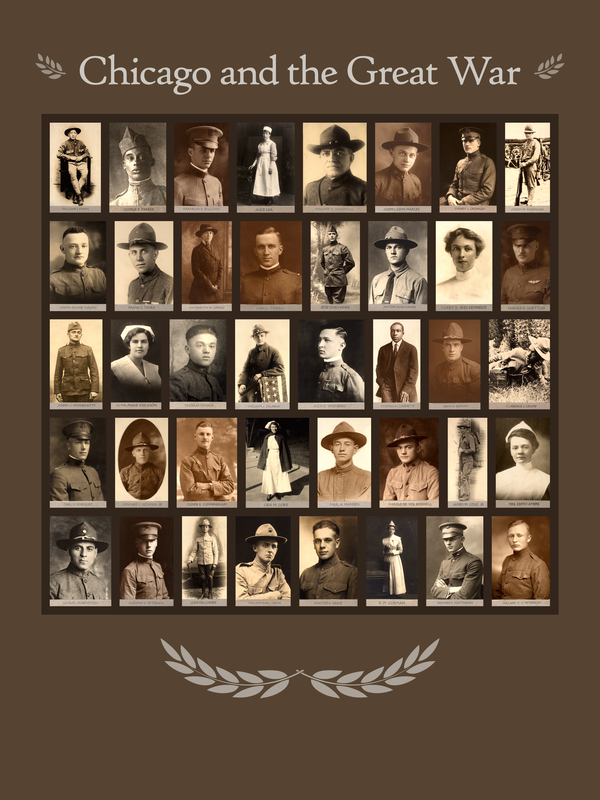 More than four thousand men and women from Cook County lost their lives in World War I. The Great War began in 1914 and pitted the Central Powers, led by Germany and Austria-Hungary, against the Allied Powers, led by Great Britain and France. The conflict claimed more than 17 million lives, left more than 20 million wounded, and shattered the illusions of an entire generation. The “war to end all wars” sowed the seeds for World War II and continues to influence our political landscape a century later. The images used in this installation are known as the Gold Star Memorial Portraits. They were collected in 1919-21 by Col. E. E. Woods, Secretary of the Membership Committee of the Chicago Historical Society, now the Chicago History Museum. Woods enlisted the aid of local newspapers and families to gather information and images of about one thousand men and women from Cook County who died in the war. The portraits were originally displayed in the main hall of the Museum’s former home at 632 North Dearborn Street. They were reinstalled in this building in1932 and exhibited for many decades. Today, the collection remains an invaluable record of the Great War and its painful legacy. View the installation in person at the Chicago History Museum, and learn more through our online exhibition here.